HEXUS reviewed the AMD Radeon VII graphics card in early February this year. AMD's most powerful consumer graphics card ever, and the world's first 7nm gaming GPU, is available now for £650 and it traded blows with Nvidia's generally more expensive GeForce RTX 2080 in our gaming tests. However, if the Radeon VII has an Achilles' heel, it is that it ran rather hot and loud when put to task. It also lacks the real-time raytracing support in the newest games boasting this tech, such as Battlefield V, Shadow of the Tomb Raider, and Metro Exodus (but Crytek's Neon Noir shows that RT cores aren't necessary for good real-time raytraced reflections). If you have bought or are intending to acquire an AMD Radeon VII graphics card, there is now a product that can help you run this card at lower temps and higher clocks. 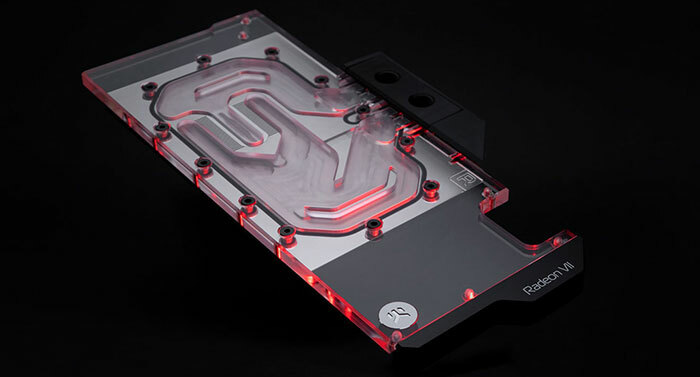 EK Water Blocks has launched the EK-Vector series water blocks for AMD Radeon VII graphics cards. These cooler replacements are compatible with all reference design Radeon VII graphics cards (all of them so far). In use the new EK-Vector series should allow users to overclock for 10-20 per cent better performance, according to the product maker. Equipping the EK-Vector series will "allow your high-end graphics card to reach higher boost clocks, thus providing more overclocking headroom and more performance during gaming or other GPU intense tasks," asserts EKWB. The design, intended to integrate with an existing liquid cooling system, channels coolant directly over the GPU, 16GB of HBM2 memory, and VRM. Thus, even while overclocked, the card will run at "far lower temperatures and less noise than factory clocked with air cooling". 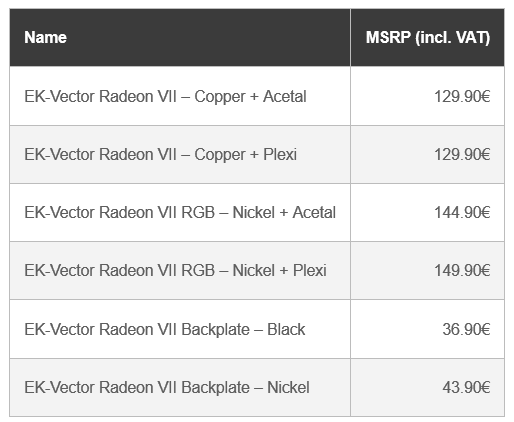 EKWB says that the base of the block is made of high-grade copper or nickel-plated electrolytic copper while the top is made of high-quality acrylic material or POM Acetal material (depending on the model you choose, see table below). To make this unit easier to install, EKWB has preinstalled brass standoffs. EKWB also includes a single-slot I/O bracket which slims down your Radeon VII from a two- to one-slot solution - handy if you want to install multiple GPUs, for example. Lastly, the EK-Vector Radeon VII water blocks include RGB LED lighting capabilities. The lighting feature is compatible with "all major motherboard manufacturers since it features a classic 4-pin 12V RGB LED strip," says EKWB. Logos for Asus, Gigabyte, MSI, and ASRock lighting standards provide an indication of this support. Those interested in this product will be happy to hear that the EKWB Vector Radeon VII water blocks are available to pre-order now. Shipping commences on Monday, 1st April.